DAN gradings take place at various times throughout the year after a JKA England National or International course - on average there are 4 DAN gradings per year. Usually there are two National and two International courses. The former at locations around the UK and the latter are currently held at the K2 Leisure Centre in Crawley. Karateka can take up to and including 5th DAN in this country. Students grading for Shodan (1st DAN) must pass an Assessment prior to attending the grading and complete a Self Assessment form. All karateka attempting a DAN grading must have the written permission of the Chief Instructor. As a candidate to take your Shodan grading, you must have attended at least two National and / or International courses - (the one on the day does not count) - one of which is within 12 months of the Grading date. You must have passed an Assessment; completed your self assessment; have permission to grade from the Chief Instructor TSKC; take two passport sized photos of yourself on the day of the grading. Your grading form will be partially completed for you. If the grading is for a re-take for kata or kumite, you will be required to produce the previous grading form as proof of taking that grading and provide information for the Examiners so don't lose it! If you are grading for Nidan and above, you are required to complete the self assessment form also. Those taking Sandan and above must attend all the days of the course they are taking the grading at. As of 1st January 2010, the new grading fees for DAN grades came into effect together with changes associated with the grading. 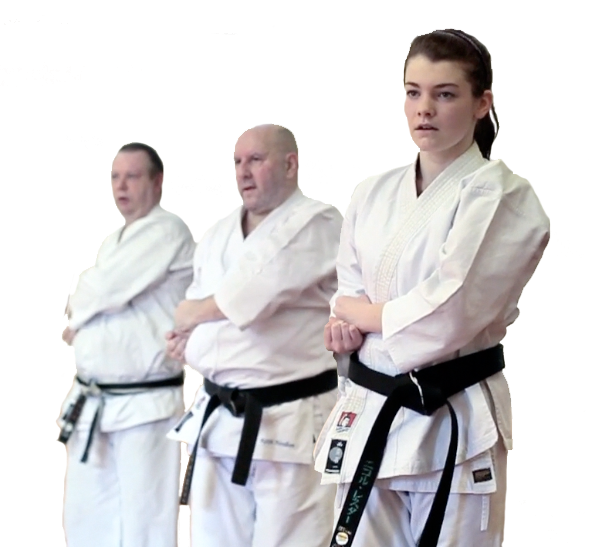 * For those who take a Dan grading and achieve only a partial pass with permission to take either Kata or Kumite only next time, the new regulation requires that this condition of taking just kata or kumite will apply once only. Therefore if you do not succeed at the following grading, you will have to take the full grading again on the next occasion. There are also DAN registration fees to be paid on the day should you be successful in passing your grading. When will I be eligible to take Shodan? You must be a FULL 1st kyu and have held that grade for a minimum of 6 months. Do I need to go on a course? You must be in a position to prove that you have attended at least 2 JKAE courses, one within 12 months from the date of the grading. The course on the day of the grading does not count. If you are grading for 3rd DAN or above, you must attend the full course associated with the grading. What is a Shodan Assessment? At TSKC, it consists of a written exam followed by a practical Assessment of your skills and knowledge. This will give you, as well as the Assessor, an indication as to whether you are up to the required standard to pass your grading. You will receive feedback after the assessment giving you valuable information on what you need to focus on for the forthcoming test. You must pass both the written exam and practical assessment. The pass mark is 60% in both. Should you pass the assessment, it is only valid for the following DAN test which is usually 2 - 4 weeks afterwards. If you do not attend that grading, the validity of the assessment expires and you will need to re-take the assessment for a future grading. The Assessment is also a self assessment and requires you, as the candidate, to confirm what is expected from you when taking your Shodan grading. Should you be unsuccessful, you will receive the assessment back with feedback from the examiners. Why do I need to take an assessment? This is to ensure the standard and quality of the students is good enough to be able to pass their grading. It is an indicator that you are capable of passing - not that you will. 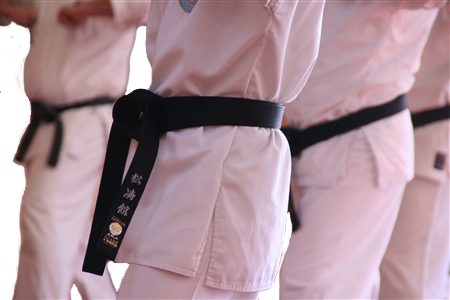 You must pass this assessment before being permitted to attend a Shodan Grading. As of 1st January 2015 there will also be a written part for the Assessment. Shodan assessments usually take place 2 - 3 weeks before the DAN grading at the Bierton dojo after the regular class. Students are encouraged to attend that class as you will be taken through the DAN grade syllabus. Are there a minimum number of lessons I have to attend? Yes - 48 as a 1st KYU. This is the minimum number deemed necessary to reach the required standard for the JKAE before taking Shodan. This will vary depending on which course you attend. See the DAN Grading Fees and Registration Fees on the NEWS page. You will also have Training fees on the day and the cost of your new belt. It'll be around £160 depending on which course you take your grading. Cash only accepted and payment on the day. No Cheques and no facility available for credit / debit cards. The certificate is sent from Japan. You will receive your certificate from Sensei Ohta at the next appropriate course. If you are unable to attend then your Club Instructor will subsequently present it to you. Besides the obvious of taking further DAN grades, you are eligible to take Instructor and Referee qualifications as well as becoming an assistant instructor - with a view to running your own club. You will need to be 18yrs+. TSKC will provide all the assistance it can to help you, if you wish to pursue this course of action. Naturally you are free to just continue training. If you need any further information or if your question has not been answered, please contact us via the online email form.